I saw a hawk on my fence in my backyard. It was sitting waiting for the Evening Grossbeaks at my feeder. We back on to a pond with all sorts of vegetation. When the Grossbeaks flew away the Hawk seemed to follow. He has a black and white striped tail, very light underparts, almost white which carried up to his head, but he had a small patch of grey starting just above both eyes that carried down his back to the rest of him. It looks like that once he opened his wings there would be those same black and white stripes. Thank you for sending us this report of your Hawk sighting - I will also post this on our Facebook page, so that our Facebook followers can also enjoy it. I have an app that can identify birds from photos, called Merlin. It suggests this could be a sharp shinned hawk which is similar to a Cooper's hawk. 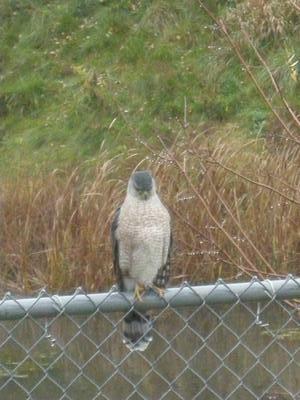 I agree Heather, this is a Coopers Hawk like the person who also commented under anonymous. Hello Heather, I'm 100% sure this is a Coopers Hawk from the tail and the description you gave, this is what I came up with. Look up this hawk and I think you will agree.